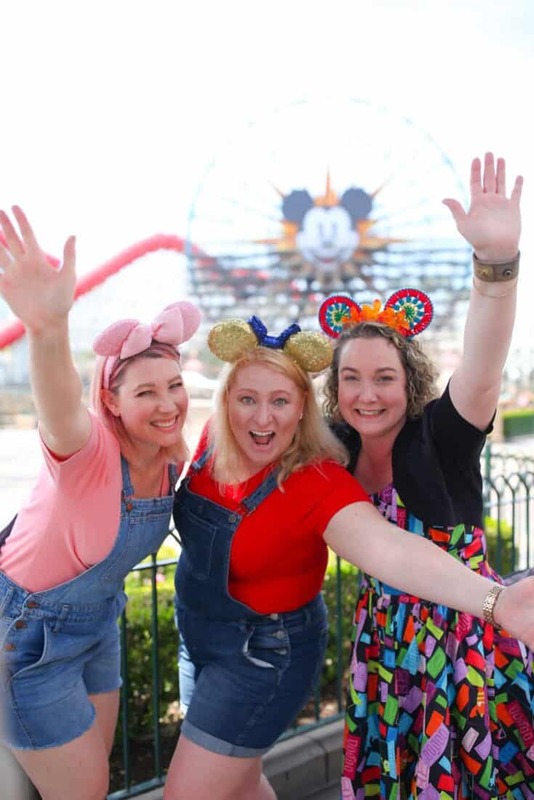 With the opening of Pixar Pier in June and the start of Pixar Fest in April, it’s going to be one gigantic, intergalactic, BFF party filled with laughter and fun at Disneyland Resort and Disney California Adventure. Pixar movies have always been more than animated movies. They pull at our heart-strings with their stories of friendship intertwining with our own, making us laugh and cry. They remind us what is truly important in life. 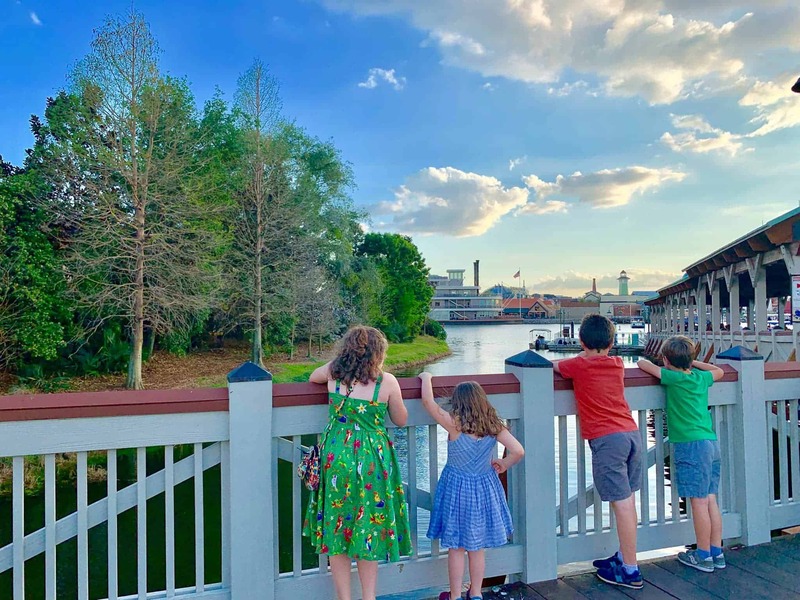 What better way to celebrate Pixar Fest than with a Mom’s Weekend away with friends. Of course, when you’re planning a weekend away with your friends, outfits are of the most importance! While I thought it would be super to have themed outfits, no one else agreed, so we all wore something uniquely us and had an amazing time together. 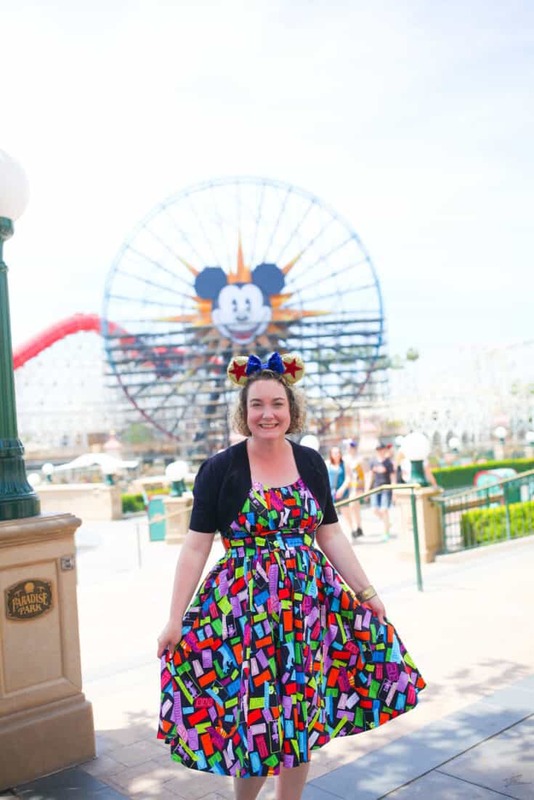 Here are a few Pixar Fest outfit ideas you’ll want to consider while you’re planning! A Girl’s Weekend with friends is always fun. 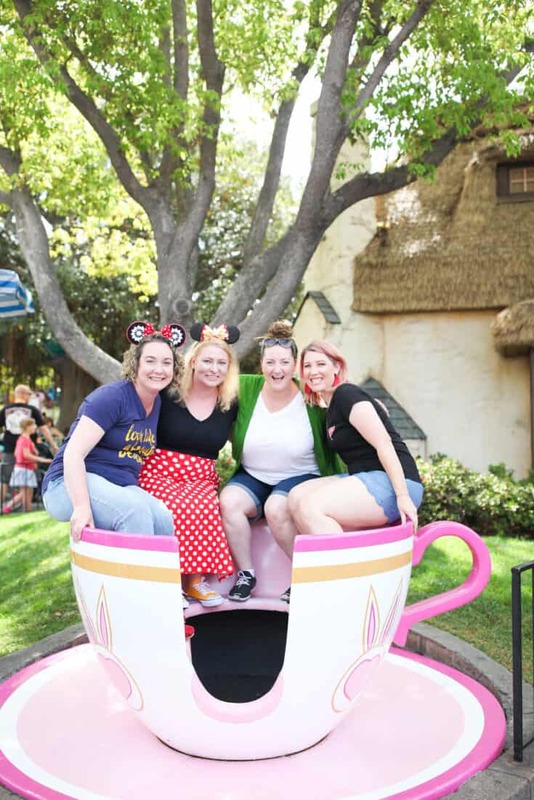 But a Girl’s Weekend at Disneyland with friends is magical. 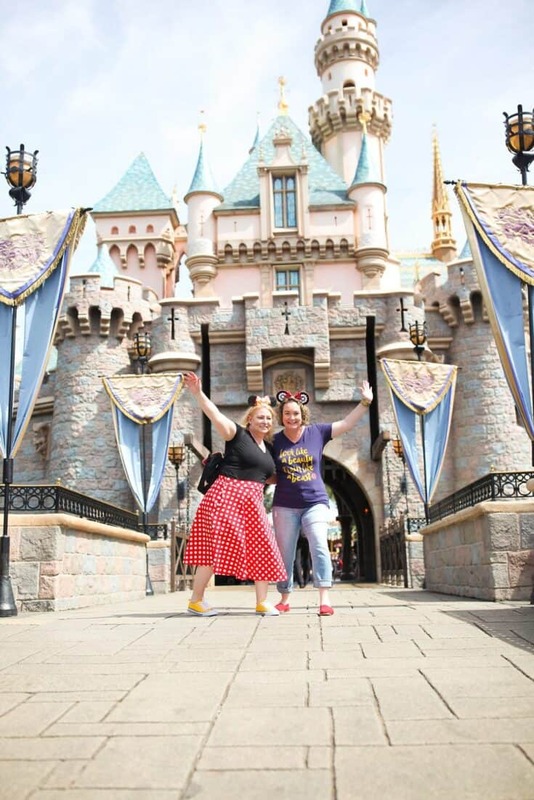 Add in the festivities of Pixar Fest, and it’s one giant BFF party that won’t disappoint. What better way to celebrate than with Pixar themed outfits! Do you love Monsters, Inc.? 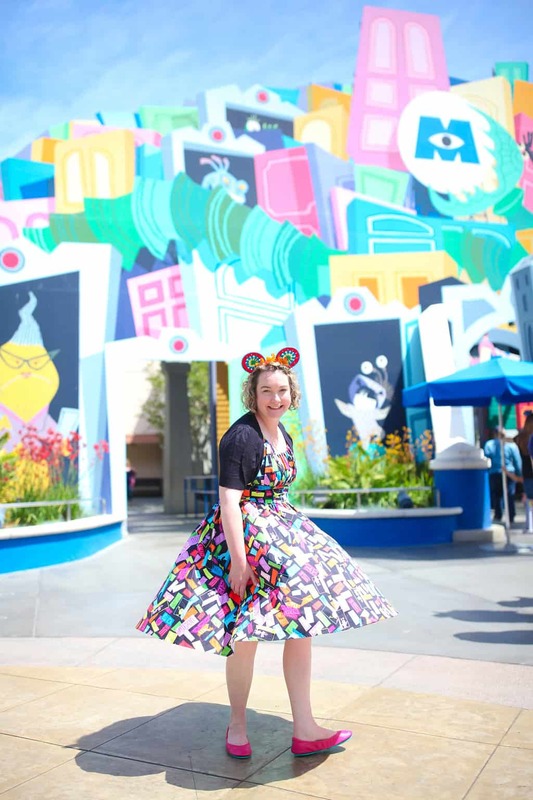 The Monsters, Inc. dress is perfect for warmer weather, plus it’s twirly AND has pockets. It’s so perfect, it’s scary! Pair it with fuschia Tieks or a fun tennis shoe, and you’ll be the talk of Monstropolis. For pictures, Mickey’s Fun Wheel across from Paradise Park, in Disney California Adventure Park, makes a great backdrop. If you want to stick with the Monsters, Inc. theme, then head over to the Monsters, Inc. attraction in Disney California Adventure Park. 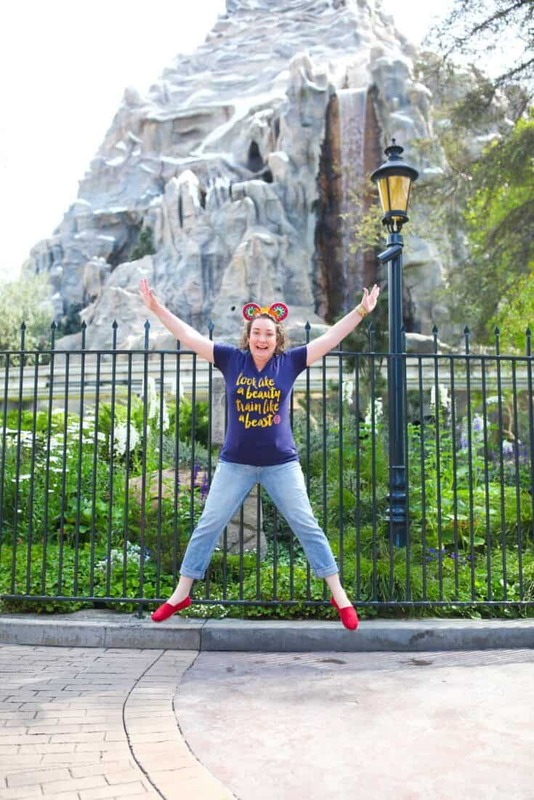 While you can totally go themed like I did in my dress, it’s also perfectly okay to go “classical comfort” in a colorful t-shirt and comfortable overall shorts that match your favorite Pixar character. Add in accessories that compliment the look and boom. 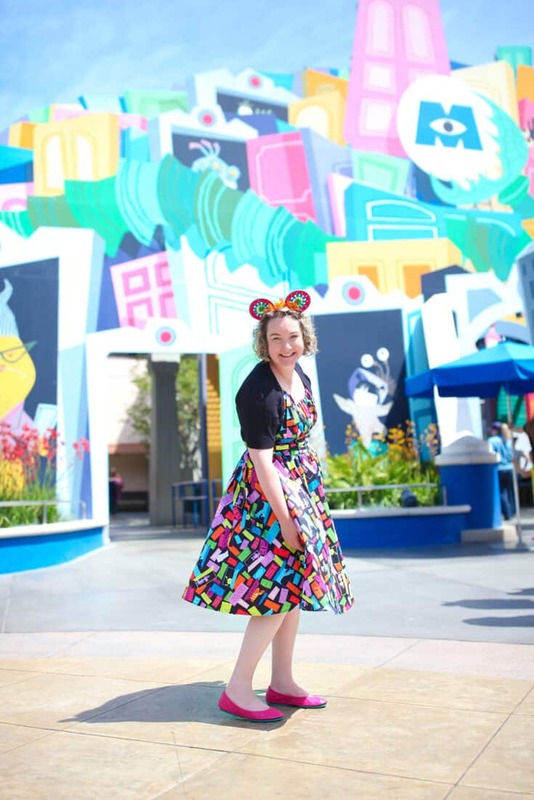 You’ve got your very own Disneybounding outfit that is as unique as you. The best thing about that is you can shop your own closet! Days at the Parks can be long and hot. You can never go wrong with comfort! While not necessarily Pixar, you can’t go wrong with classic Mickey or Minnie! Again, it’s all about the colors! Red and white polka dot skirt with yellow Converse and a black top says Minnie Mouse all day long. You could even wear a red and white polka dot dress! Sometimes, simplicity and comfort win. Take this Pixar Fest outfit idea for example. 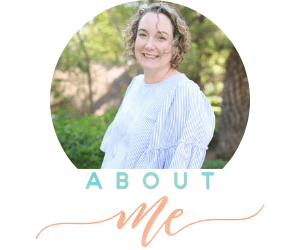 A t-shirt from Raw Threads, jeans from Stitch Fix, and red TOMS, because of course. It was casual, comfortable, and perfect for when the weather warmed up. I do need to work on my jumping skills though. Whatever you do, don’t stress about clothes. The memories you’ll make with your friends will be what you remember, not what you wore. Don’t forget, Pixar Fest at Disneyland Resort and Disney California Adventure Park runs through September 3rd! Have an intergalactic time with your BFFs! 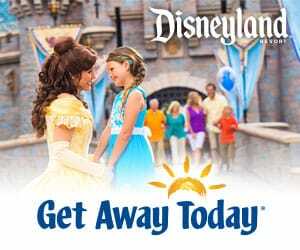 Are you planning on attending Pixar Fest or the Grand Opening of Pixar Pier? What are you wearing?